The Maltese is a small, refined, and joyful dog with long, soft, white hair. This dog breed is intelligent and compact, making it a conveniently portable little dog. The Maltese is a charming lap dog that does well in households that want a small companion dog. The Maltese can be traced back over 28 centuries and it is an ancient breed of the island of Malta in the Mediterranean. This dog breed can be found on ancient Greek pottery and was mentioned by the philosopher Aristotle. It has been known to be a prized companion of royalty over the years. Unlike many small breeds, the Maltese was not bred down from larger sizes; it has always been a very small dog. 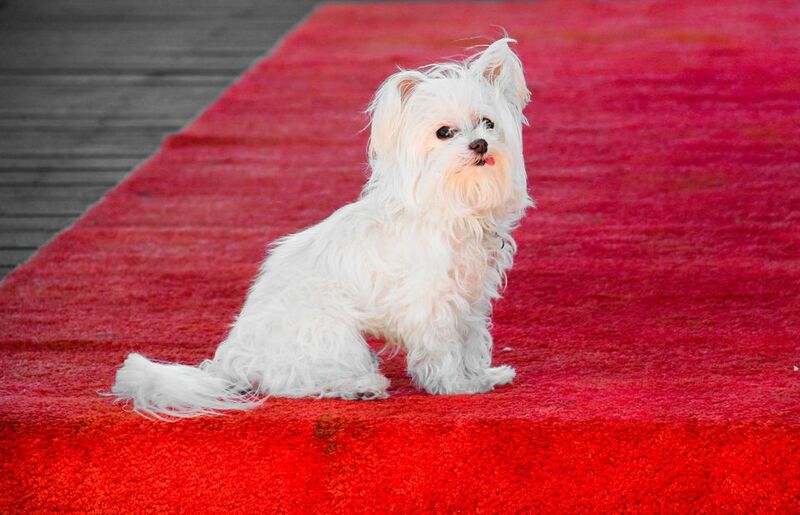 The Maltese has remained a dog breed of distinction—highly esteemed and quite sought-after. This breed became popular among upper-class ladies in England in the 1300s. Attempts to breed even smaller Maltese in the 17th and 18th centuries resulted in tiny dogs the size of squirrels, but this effort almost wiped them out. They were crossbred with other small dogs to revive the breed and this resulted in the development of several related breeds. Toward the late 1800s, the Maltese was introduced to the U.S. and was officially recognized by the AKC in 1888. The breed has remained relatively popular to this day. The soft coat of the Maltese grows continuously. Many owners choose to keep the hair trimmed short and it takes on a wavy and fluffy quality; others keep the coat long and flowing. Because of this coat type, routine grooming is an absolute necessity. The Maltese should be brushed two to three times per week (up to once daily if the coat is kept long). Haircuts may be necessary every several weeks. Maltese are prone to showing tear staining underneath the eyes. There are products available at pet stores to help remove these stains. Those cute bows or topknots you see on a Maltese serve the purpose of keeping the hair out of the dog's eyes to prevent irritation. You may also note that the nose of the Maltese gets suntanned in summer to black and fades when they don't get sun exposure, which is known as winter nose. This breed needs good attention to dental hygiene to prevent teeth and gum problems. You may need to brush your dog's teeth daily or a minimum of two to three times a week to ensure his mouth stays healthy. Considered to be a hypoallergenic dog breed, it may be suitable for those who are mildly or moderately allergic to dogs. That term "hypoallergenic" is disputed by allergy specialists since allergies are provoked by proteins in dog saliva and dander rather than the fur. But as a small dog that sheds little, a Maltese may release less of these allergens. The Maltese have a moderate energy level and need exercise. Daily walks and fun activities like games can help keep your Maltese mentally and physically stimulated. The breed does not tolerate extremes of heat or cold well. Especially in cold weather, the Maltese lack an undercoat and you should provide a sweater if taking your dog outdoors for a walk. With more than 2,000 years as a lap dog breed, you can expect that a Maltese needs constant human attention and may exhibit separation anxiety if left alone for long periods. They may bark continuously or become destructive. For this reason, they are best in households where you will be home throughout the day or you are able to keep your dog with you when away from home. As a delicate little dog, the Maltese is not recommended for a household with small children due to the risk of injury to the dog. They may be a suitable choice for families with well-behaved older children. A Maltese may also become overly-protective of his owner and become defensive around children and other animals, displaying barking and biting. Maltese may be difficult to housebreak but it is also possible to paper train or litter train them so you do not need to take them outside. Feed your Maltese two meals a day for a total of 1/4 to 1/2 cup dry dog food. While this may seem to be a tiny amount, they do not need much. They can be picky eaters and have sensitive digestive systems. They can be quite persuasive in getting you to give them bits of your human food, but you need to be consistent in avoiding this. Otherwise, you may see weight gain and even more picky eating behavior. Be sure to provide fresh, clean water for your dog. If you note any weight gain, discuss this with your veterinarian to get a recommendation for a feeding schedule, amount of food, type of dog food, and exercise needs. You may wish to research many different dog breeds to find the right one.